Blue Marine has a minion! When the World is mean to you, you do not answer by being worse. If you do your part and be gentle, fair, and polite... Everything will be alright in the end. Things are not always in your hands, and not everything is your fault. That's something that I... Really had a really hard time understanding. One of the things that used to make me very nervous and anxious, was the thought that every decision I made were terrible. However, it took me some time, but I did learned how to break those thoughts. We make decisions but we can NOT predict the outcome of them, no matter what we tell ourselves. So... Not knowing something do not make you guilty, nor it makes you bad at making decisions. Just please. Be gentle with yourself. Best quality: Will literally help everyone that needs help, on his own way. Greatest flaw: Easy to take advantage of. Will probably get hurt in the future because of it. Appearance: Marine can have two forms. 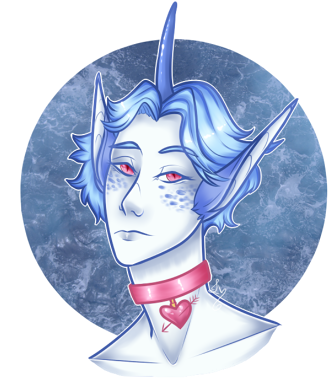 A more human-looking one and the "merman" looking one. Both forms his skin is very pale, but slightly blueish. 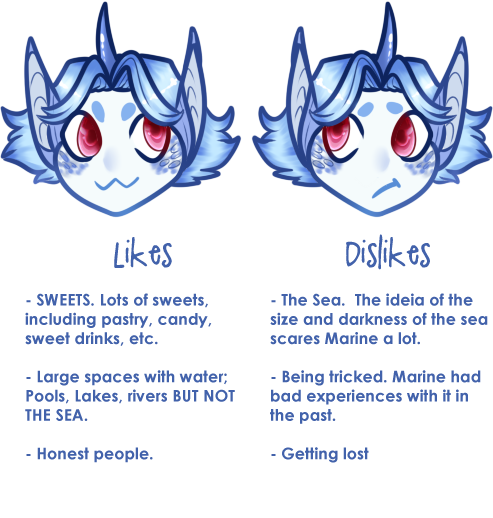 On his cheeks, Marine has some more strong-blue scales, strong pink to red eyes, and a slightly sharp face. He also have big horse ears and a very smooth horn. 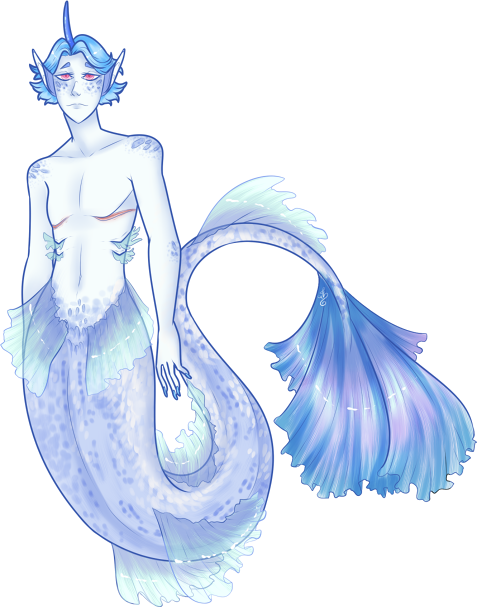 On his more human looking form, his body doesn't have as many scales has the merman one, and his ears are not as big. His hands are skinny and he has long fingers with blueish nails. 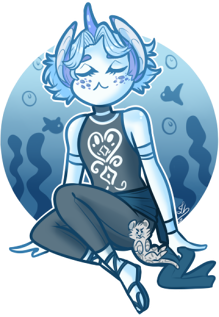 When in merman form, his nails become more sharp and actually a bit dangerous, so Marine keeps himself very carreful when near other people. 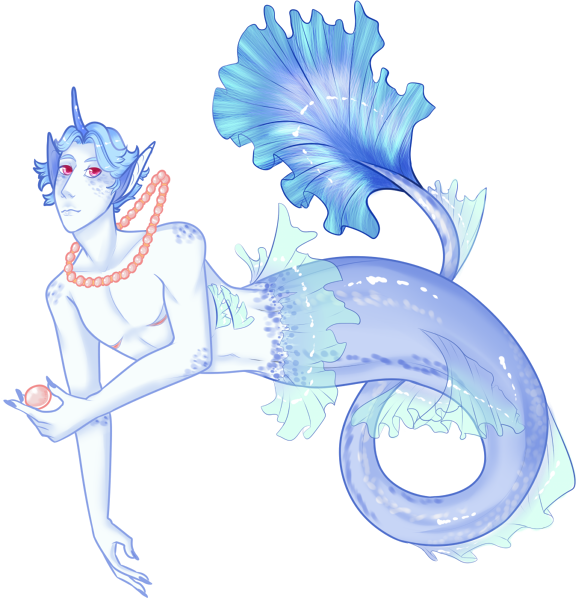 As a Merman, his scales are bright blue to pastel purple, and his fins are a bit transparent with a very light blue. Personality: Marine is a very fragile person, with strong feelings towards most people. He has the feel that he needs to take care of people, and sometimes that makes him an easy target to toxic people. Marine is gentle, calm, and very kind. However, he also can be a bit childish, stubborn, grumpy, and a bit dense from times to time. Unlike Fuchsia, Marine doesn't mind losing from time to time, nevertheless this doesn't mean Marine doesn't get stressed out on his job. Actually, Marine is one of the most stressed out people to work on his field. Mostly because he feels like he owns people a victory on certain cases, trying too hard on things that he puts his mind on, being extremely stubborn. As Fuchsia says; "Like a dog who won't let the bone go." |||| Marine has a secret instagram account just to post pictures of the sweets he eats. |||| He's friends with Raziel, who owns a resort where he can go relax a bit. Raziel insists that Marine relax with him, and although he can be a bit pushy, it helps Marine a lot. |||| Poor Marine is easily spooked. Even when people are not trying to actually scare him, he gets a lil bit jumpy. |||| NEVER scream with Marine. He will probably cry and try to look tough while crying. |||| Marine is a very touchy person. Hugs are his strong suit. Oh, Marine. The poor daemon went through a lot. Being the youngest child of a very healthy family who focused their entire hierarchy into forming lawyers that serve as the most admirable lawyers on the Daemon territory, Marine was forced into a life he didn't even had the free will to question. Even when Marine was just a child his family found their ways to provide the best education to their children, and this included being homeschooled by the best professors they could find. However, because of that, Marine never really had much familiarity with other children, thus being someone really socially awkward. His life was some kind of bubble, and everything around him was his tiny little kingdom. When going to college, that was the first time Marine actually had touch with lots of different people. He discovered a lot in there, about others and about himself. He never thought about the possibility of doing something "contrary" his parents or his life or everything he was. That helped him realized why he never felt good while being treated as a girl, and why he felt so invalidated. His friends - Some of them he still keeps in touch and loves them very much - helped him with every single change he went through and were very supportive. Being someone too sensitive and fragile, Marine grew up being used as the scapegoat of the Moores' family. 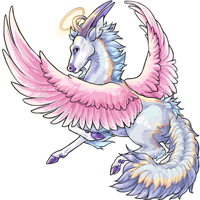 His older brother Fuchsia, being the best lawyer in the territory while Marine was always number two. This never really bothered him, since Marine isn't a very competitive person, but he never liked the way Fuchsia treated him. However, Fuchsia still loves Marine. Yes: In a very wrong way, being rude and a little aggressive, sometimes doing wrong when he thinks he's doing what's "best for him", but Fuchsia always supported Marine, and was the first one Marine came out as trans. Although Marine's life isn't perfect, but isn't the worse either, he is happy now. He is very aware of his privileged life, and how lucky he was to have such supportive friends and family. That's why he thinks he should give it back to the world; Helping those who can't help themselves, and being gentle with people, even when they don't deserve it. "Life is good." My not-so-dear brother. You have a very violent love towards me, and that's ok.
You are such a kind, gentle soul. I just wish for you to start loving yourself. I don't really trust you. You don't pass me as a good person.